It’s been a couple of months since I’ve done an Anime Saturday feature and I feel bad about it. Not least of all because I’ve got a lot of stuff piling up and waiting to be reviewed. What can I say, other than this is a crazy time of year for me, I don’t have as many weekends off, and time is more than a little tight. Nonetheless, I’m off today and had some time to enjoy a leisurely morning with a pot of coffee and time to open up a Figma. 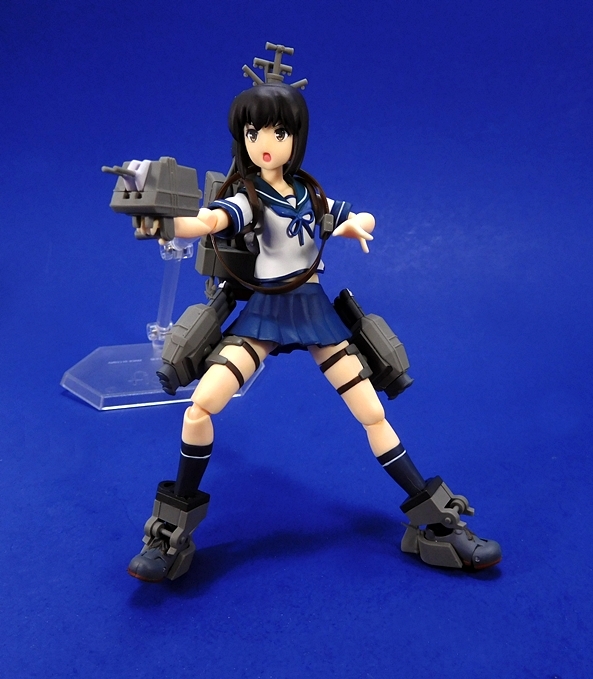 And wouldn’t you just know it… it’s another one of the Fleet Girls from Kantai Collection! 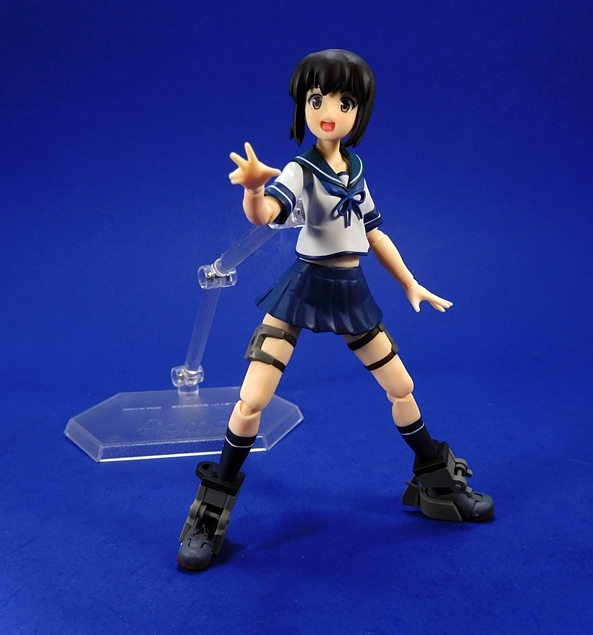 And it’s Fubuki! 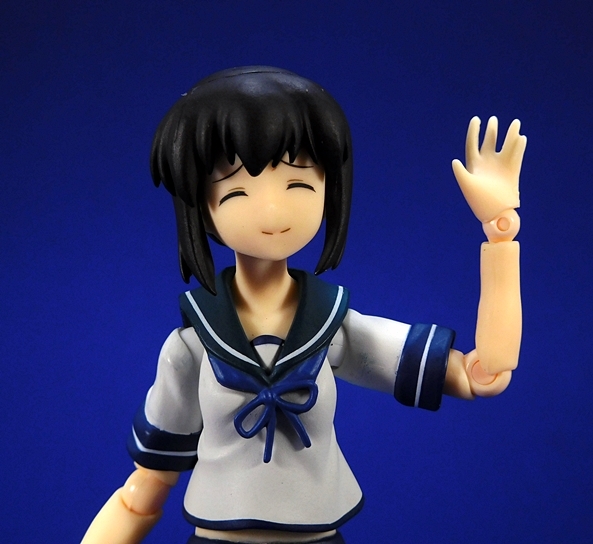 It’s crazy to think that with five or six of the Fleet Girls already on my Figma shelf, it took this long to get to the main protaganist of the anime. In this case, however, she hasn’t been sitting around waiting to be reviewed, but rather she’s a fairly recent release. I’ll also point out that this is the Animation Version, with a regular version releasing very shortly. I’ve looked at pictures of both figures and I can’t for the life of me see any difference. But seeing as how I’ve never actually played the game, I’m content with the version tied to my beloved anime series. 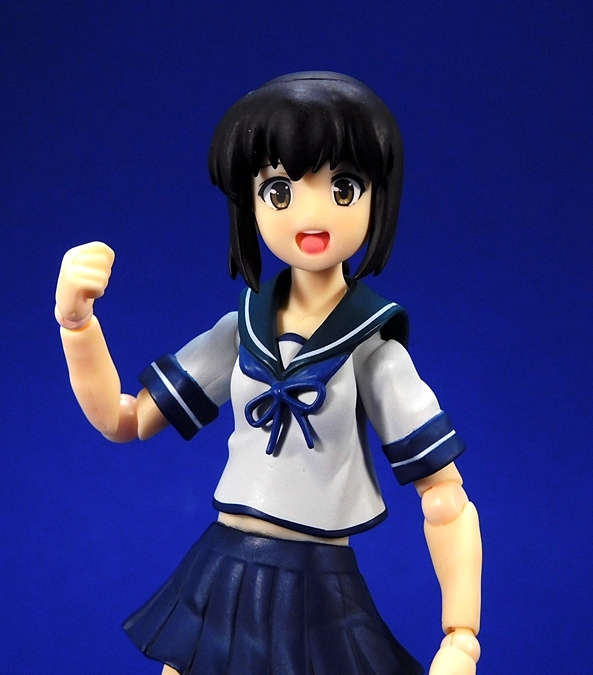 Starting out with the base figure, Fubuki features here school uniform, including her sailor-style white top with a blue collar and blue sleeve cuffs, and a perfectly sculpted neckerchief tied below her neck. The top is just short enough to show a little midriff, and below that she has a pleated blue skirt. The outfit is topped off with a pair of blue socks, each with a tiny white stripe around the top, and crisp white anchors printed on the sides. 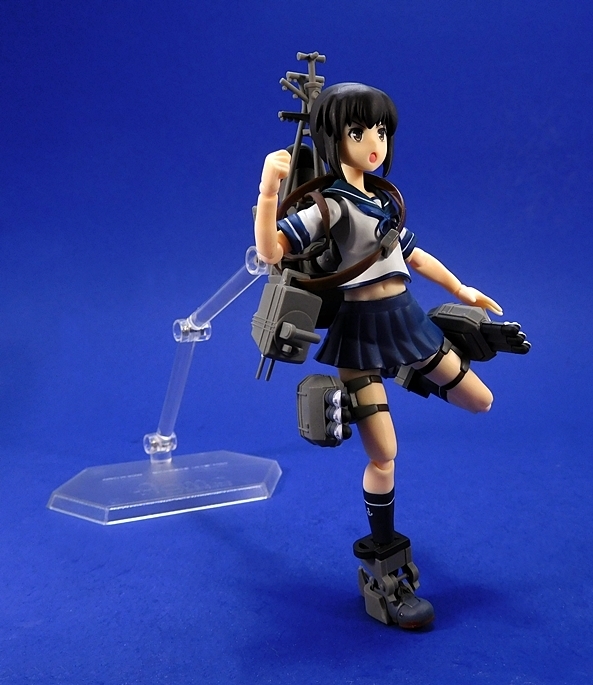 While you can strip most of Fubuki’s armaments from her, the leg straps for her torpedo mounts, and her rudder boots are permanent fixtures. This could be disappointing to some collectors who would have preferred the ability to display her completely off duty, but it’s not such a big deal for me. The boots do feature some really nice detail. 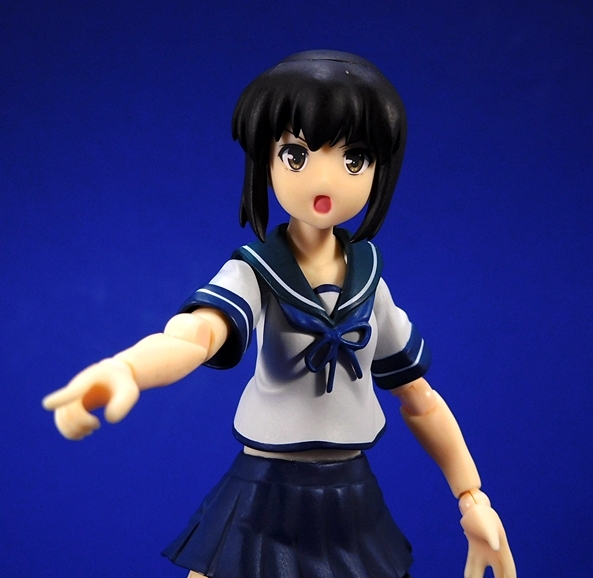 Of course, this is a Figma, so you can expect all sorts of extra facial expressions and hands. 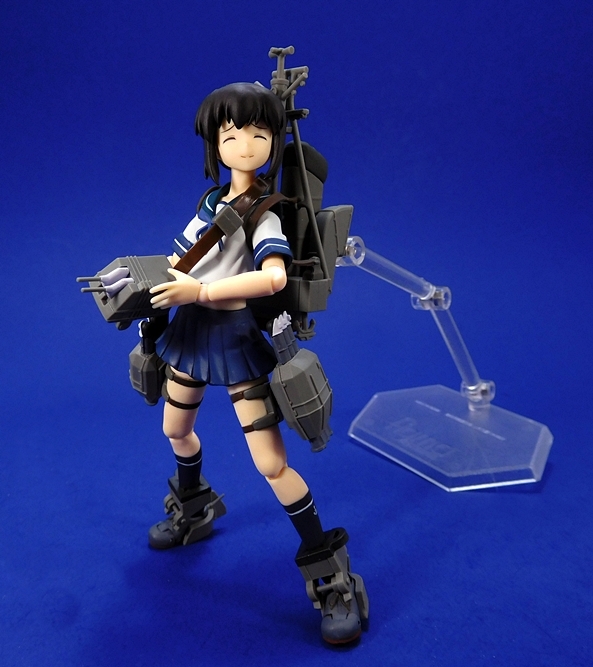 Fubuki includes three expressions, one normal, one extremely happy with eyes closed, and one serious battle face. Swapping them out involves the usual easy step of popping off the front of the hair. My little gripe here is that the normal face and the battle face are a little too close in my opinion. I think the fault lies with the normal face, which looks more surprised to me. I would have liked something a little more neutral there. 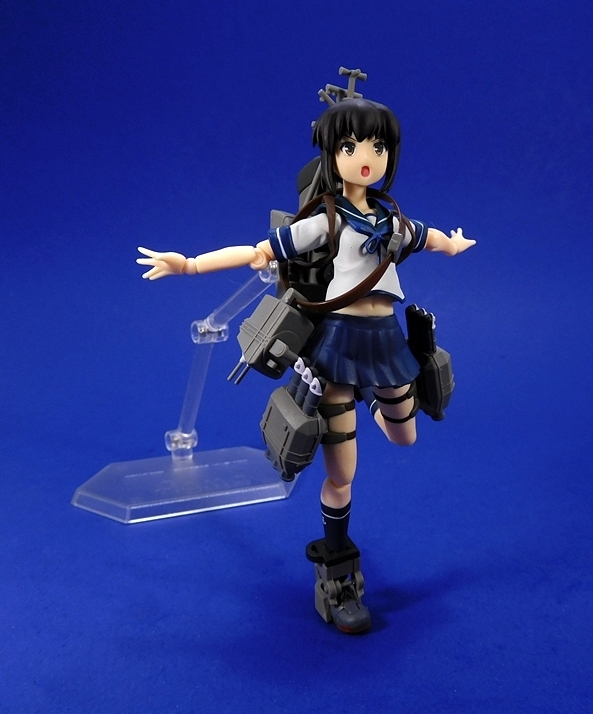 For starters, Fubuki comes with her two 61cm triple torpedo mounts (oxygen powered, of course!) attached to her thighs with somewhat restricted ball joints and some sculpted faux straps on her legs to simulate holding them on. You can easily swivel each torpedo mount from pointing up when they’re not in use to facing forward for firing. There’s a little bit of motion left and right, but not a lot. As already demonstrated, these are easy to pop off the figure if you want to display her in her down time. 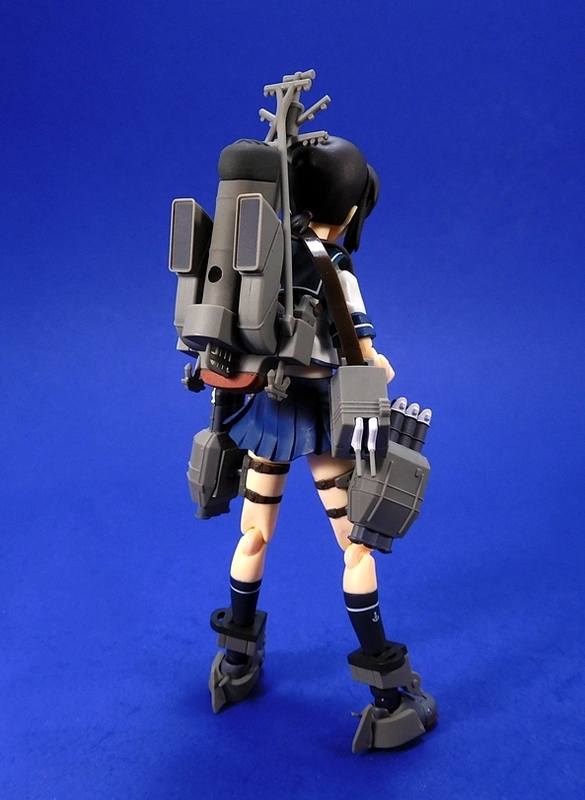 Next up are her 12.7cm twin gun mount and her backpack. 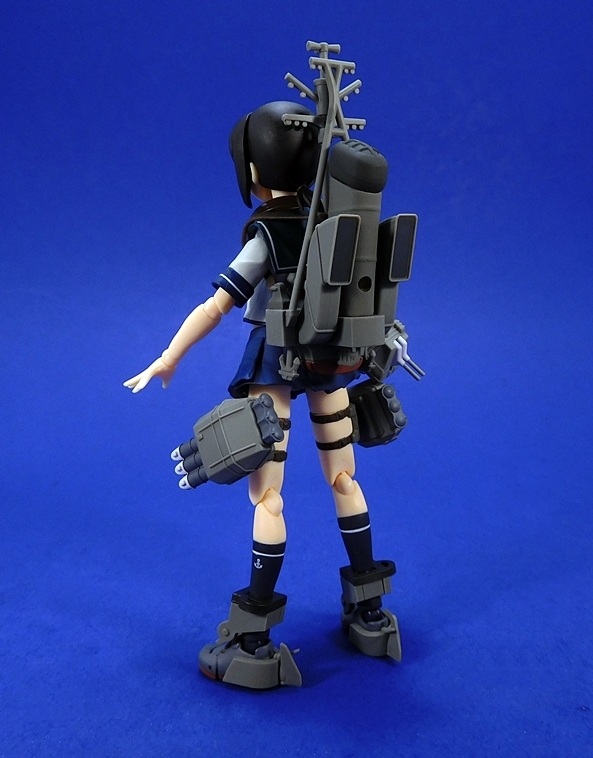 The backpack attaches with a ball jointed peg, which keeps some space between it and her back to allow it to not interfere too much with her posing. 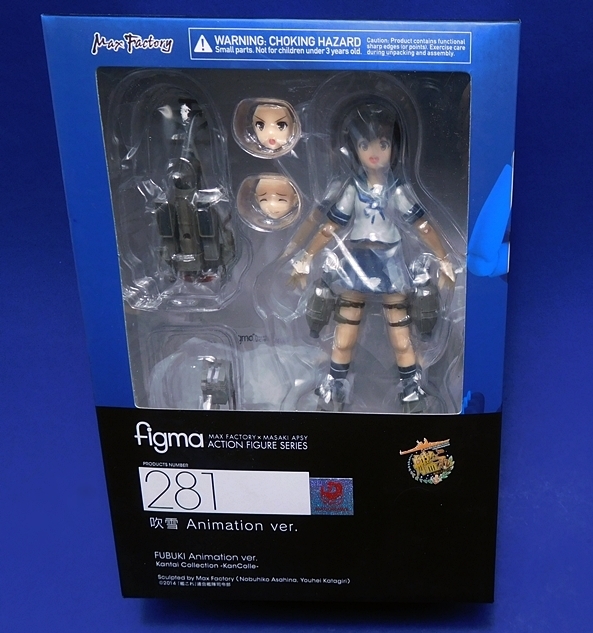 Subsequently, there’s another peg hole on the back of the smokestack to plug in the Figma stand. 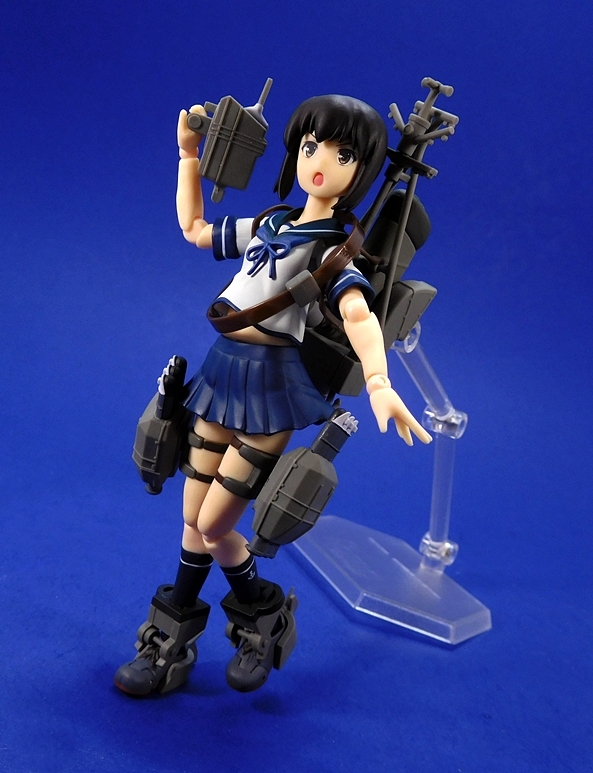 It certainly helps, but I’m surprised to see that even with the backpack, Fubuki is balanced enough to stand on her own. The backpack itself is a nice piece of work with all the detail I’ve come to expect out of a Figma sculpt, right down to the twin anchors and antenna. The piece is cast in battleship gray plastic and there’s a little black and red paint added. I’ll note here that the peg for the stand is a tight fit going into the backpack. Normally, Max Factory includes an adapter piece with a narrower peg, but that wasn’t the case here. It does work, but not as well as if they had included the extra piece. 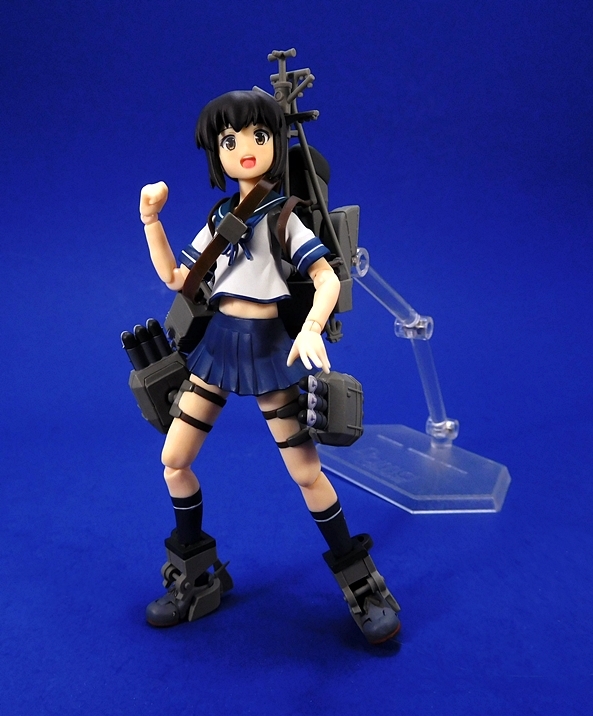 The twin gun mount is designed to hang on a shoulder strap at her right hip for easy access to it. The strap itself is a little bulky, but not too bad considering the scale. 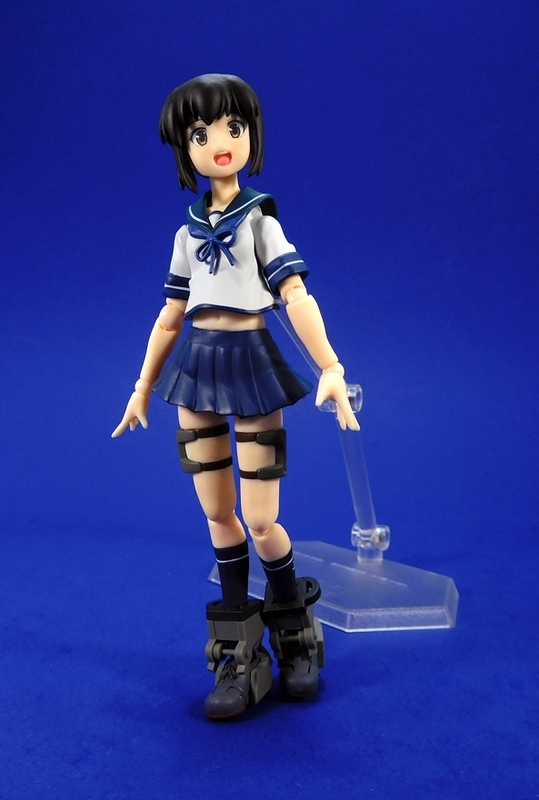 The gun mount attaches to it with an open ended clip, so it’s really easy to take it off the strap so she can hold it and then put it back on again. 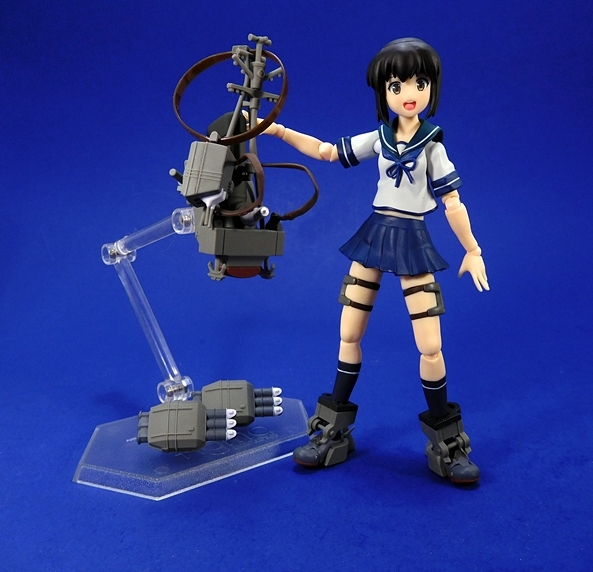 As mentioned, she does have a pair of accessory holding hands, but she only fires this thing from her right hand in the anime, so one would have been fine for me. The grip on it is a little loose, but for the most part I didn’t have much trouble getting her to hold it straight. Fubuki isn’t the most complex Figma around, but she sure does hit all the right points and she’s a lot of fun to play with. But that doesn’t come as any surprise to me. 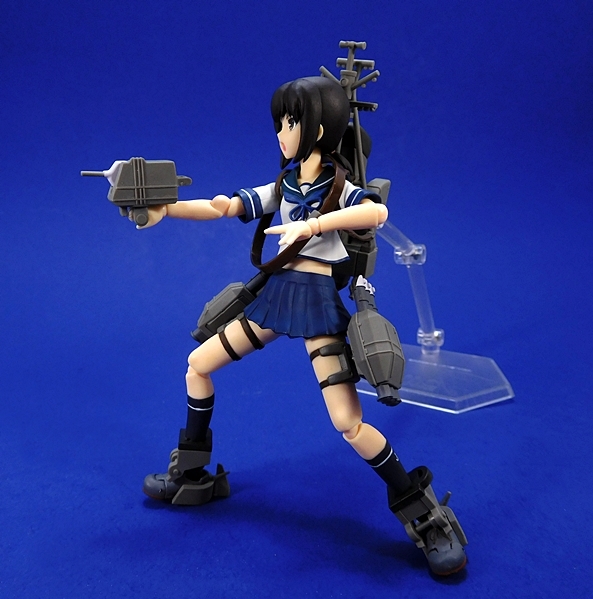 The base figure is just about perfect and by now Max Factory has become experts in fashioning Fleet Girl armaments. 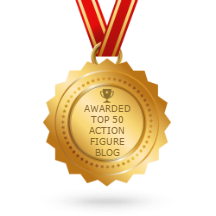 The only kicker here is that with an original retail of around $60, these figures are approaching that ceiling where I’m beginning to think twice before buying. 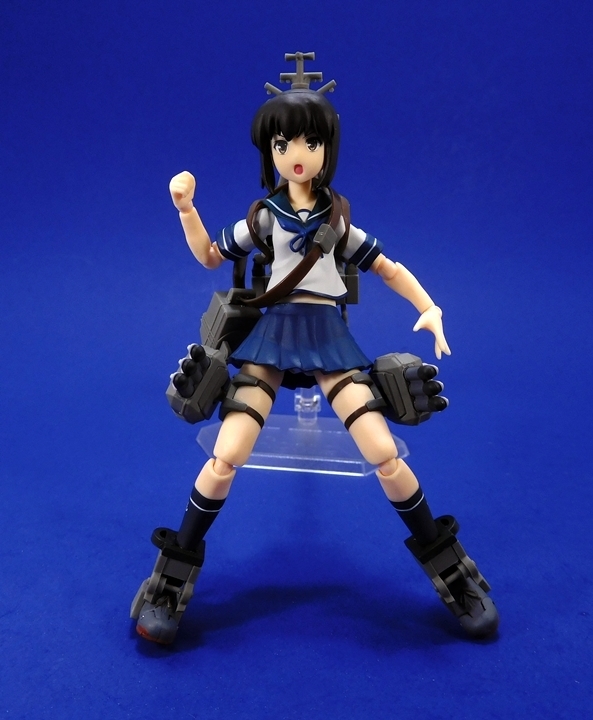 When it comes to the KanColle figures, I’m probably always going to crumble, but as for those franchises that I’m a little less enthusiastic about? I might have to start getting pickier. As for now… I can’t help but notice the two empty spaces on each side of her and wonder if Figma is planning on getting her fellow Destroyers, Mutsuki and Yuudachi out eventually.